Is there anything this feature-packed 9.2-channel HD receiver from Onkyo can't do? Hi-fi amplifiers and receivers are straightforward devices, built simply to make the best-sounding noises that their designers know how. They're generally not heavy on user features, because all non-essential circuitry inevitably degrades sound quality to some extent. By and large you can tell which are the good ones because they are stripped down and minimalist in tone. They rarely have tone controls, DSP or other toys, and even more rarely are they the most powerful in their price class. Home cinema amps are something else. Most of them receive radio broadcasts (and so become 'receivers'), often via the internet, in addition to FM, MW and sometimes DAB. But they have other purposes, too. They are designed to handle a wide range of sources of different types, often in digital form from a Blu-ray player, and convert it into a multichannel feed via a spatial processor based on Dolby and/or DTS technology. It will usually be required to feed 5, 8 or even nine loudspeakers plus a subwoofer or two. For a variety of reasons, the requirement to do more than simply amplify has become rampant; so much so that Onkyo, purveyor of the TX-NR3007 auditioned here, is working on a stripped-down model intended to put sound quality first, and which will have the absolute minimum of unnecessary trimmings. Personally, I can't wait, but don't expect to hear more about it for a while. Meanwhile, this AVR has no such minimalist pretensions. It is best regarded as a toolkit for moulding the sound into your chosen pattern and, as I discovered, it's very powerful and flexible. A 9.2-channel (count 'em) THX Ultra2 Plus receiver, the TX-NR3007 is second only to the top-of-the-range TX-NR5007. It has one fewer HDMI input, one less audio input (but you still get plenty of both) and a slightly simplified arrangement of power transformers. There are three here: an open frame power transformer, and one each for the remaining audio and video circuits. Onkyo sells a simpler model too, this time with a single mains transformer, the £1,300 TX-NR1007. THX Ultra2 Plus is an enhanced version of the familiar THX Ultra2, optimised for slightly larger rooms where the listener-to-main speaker distance is 4 metres or more (although less is okay, too), and with an enclosed 85 cubic metres or more – a really big room in other words. It also has an enhanced volume control system called THX Loudness Plus, which enriches the ambient soundfield when listening at lower volume than the THX-specified level. As for other highlights, the TX-NR3007 is said to be currently the only receiver available in this price-range with ISF (Imaging Sciences Foundation) video calibration. It allows the user to calibrate the receiver to the screen, independently of any calibration available on the display itself. With ISF, parameters like brightness, hue, contrast saturation and gamma can be set individually for each video input. Elsewhere, HQV's powerful Reon VX processor can be used to upscale standard-def video – very effectively as it turns out – while audio conversion uses proprietary VLSC circuitry, 24/192 DACs with Texas Instruments jitter-reduction technology. Tasty. Last but not least, the Onkyo is one of the few receivers capable of processing DSD (the file format of SACD) natively, without prior conversion to PCM. The Onkyo's room calibration is handled by Audyssey's MultEQ. This takes an age to tune itself, and works in conjunction with Dolby Volume, and two Audyssey technologies called Dynamic EQ and Dynamic Volume that 'optimise the frequency response and dynamic range at all volume levels'. This machine knows a thing or two about radio, as well. The powerful vTuner suite, which is one of the most capable (and usable) of its kind, is specified for 'net radio reception, although the NX3007 also has its own FM/MW preset tuner, and an optional external DAB+ box can be added. The Last FM radio and music community website is also supported through Windows 7, which utilises DLNA 1.5 'Play To' streaming. The Ethernet port provided also allows for easy firmware updating over the internet. Working with the various surround iterations that are built-in, the Onkyo confirmed my long-standing preference for Dolby over DTS, which tends to sound more neutral, open and spacious. DTS works well enough, but with an added warmth and a slight loss of detail – the overall effect is clearly less natural. Some of the most impressive results during my testing period were from one of the best Blu-ray discs to date – Cloverfield – using Dolby TrueHD with the 3007's extra two channels configured for height thanks to Audyssey's DSX processing. The result was remarkably solid and three-dimensional, even when auditioned from well off the system centre-line. Special effects and explosions were stunningly – almost frighteningly – realistic. But spatial decoding is a moving target, evolving with the release of more films on Blu-ray. When it's good, it's very good, but all too often it disappoints. Cloverfield and a handful of others (such as the 007 vehicle Quantum of Solace – a very impressive soundtrack), hint at what the medium is capable of. And I have an excellent classical collection to hand, Trondheim Solistene, which is supplied as a multidisc set – Blu-ray, DVD (LPCM) and SACD (DSD). The latter sounded brilliant, the Onkyo doing a clearly better job with the DSD track from the SACD disc than the PCM output of the Blu-ray disc. 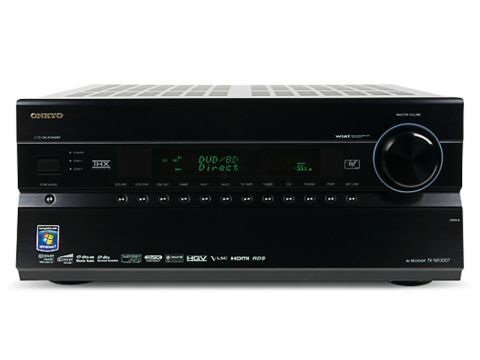 The TX-NR3007 truly ups the ante of what can be achieved by an AVR at this price point. I had no problems operating it, after some false starts, partly related to pressing the wrong menu options or remote control buttons on the artlessly designed handset. If I have a criticism of the receiver it is that although the features I dabbled with appeared to behave as advertised, the detailed setup needs meticulous care to optimise. Having said that, the Onkyo is more straightforward than most of its peers to configure thanks to a straightforward and easily comprehended OSD. I am grateful for (and was relieved to receive) the help provided by an Onkyo representative who helped with system setup and by imparting his knowledge of some of the more complex features. Even so, getting to grips with this feature-laden receiver is a formidable enterprise. There wasn't the opportunity to use a THX Ultra2 specified speaker system, but in my judgement this isn't strictly necessary. Well-chosen speakers of mixed parentage are likely to do as good, or a better job, at reasonable volume levels in most rooms. In most respects, the Onkyo is outstandingly capable, and great value for money, yet I do worry the unending arms race of new technologies puts many people off buying models like this, and impedes the growth of the market for high-performance home cinema as a whole. However, this does not detract from the Onkyo's class leading flexibility, or its sound quality performance, which was borderline excellent for much of the time, and sometimes simply breathtaking.